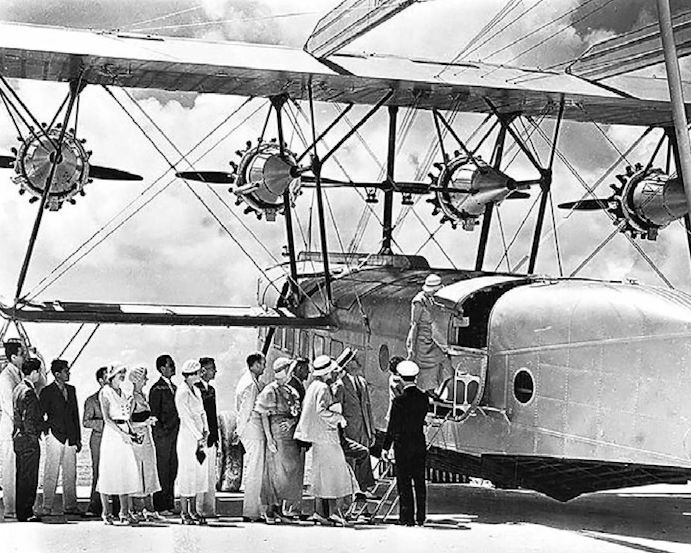 В 1929 году "Pan American" через Чарльза Линдберга, занимавшего с января 1929 года должность технического советника авиакомпании, обратилась к Сикорскому с просьбой разработать более крупную летающую лодку, которая имела бы большую вместимость и дальность ДальшеMore>>> полета, чем Commodore и S-38. Сикорский решил добиться желаемого результата в два этапа. Сначала он создал летающую лодку S-40, способную перевозить 24 пассажира на расстояние 1529 км или 40 пассажиров на более короткую дальность - порядка 800 км. S-40 был разработан на основе S-38, сохранив его оболочечно-двухлонжеронную конструкцию, но имел существенно большие размеры. Самолет был рассчитан на перевозку экипажа из шести человек и до 40 пассажиров. Базовая конструкция самолета - металлическая, на нижнем крыле устанавливались межкрыльевые подкосы и подкосы для поплавков. Силовая установка включала четыре звездообразных двигателя Pratt & Whitney Hornet мощностью по 575 л. с.
Первый заказ на летающую лодку S-40 был размещен компанией "Pna Am" 20 декабря 1929 года и включал всего три машины. Выкаченный из сборочного цеха в октябре 1931 года S-40 стал самым большим самолетом-амфибией в мире. Первая машина получила название "American Clipper", а первый полете пассажирами на борту состоялся 19 ноября. Самолет вылетел из Майами в сторону Панамского канала с промежуточными остановками в Сьенфуэгосе на Кубе, в Кингстоне на Ямайке и в Барранкилле в Колумбии. Пилотировал самолет экипаж в составе Чарльза Линдберга (командир экипажа) и Бэзила Роува, а среди пассажиров находился сам Игорь Сикорский. Второй и третий самолеты были поставлены заказчику в ноябре 1931 года и августе 1932 года. Все три машины совершали регулярные полеты со своей базы в Диннер-Кей по маршрутам Майами - Гавана, Кингстон, Барранкилла и Кристобаль (Панама). Самолеты S-40 работали преимущественно на Карибах, налетав за долгую карьеру 10 млн миль, причем без каких-либо инцидентов. Самолет считался роскошным для своего времени, в распоряжении пассажиров даже была курительная комната. В 1935 году S-40 оснастили двигателями T2D1 Hornet мощностью по 660 л. с., после чего они получили обозначение S-40A. После удара японцев по Перл-Харбору самолеты были реквизированы ВМС США и до 1943 года использовались в качестве транспортных и учебных. THE Sikorsky Aviation Corporation of Bridgeport, Conn., have just announced the sale of two 41-passenger Sikorsky Amphibians, costing $125,000 each, to Pan-American Airways. 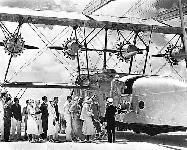 For some months past the Sikorsky company has been working on the design of this amphibian, which is known as the "S-40," and on the approval of Col. Lindbergh Pan-American Airways signed for the first two to be constructed - and these, it is hoped, will be put into service in December next in the inauguration of a 24-hour service between New York City and Cristobal, Canal Zone. Passengers and mails will be carried by night from New York to Miami in small machines, thence the 1,200-mile jump across the Caribbean Sea to Cristobal will be made by the S-40's. The S-40 amphibian is the result of a very extensive experience with 4-engined 'planes abroad and of two years' operating experience of the Sikorsky S-38 and other models on Pan-American Airways, etc. The present design has been arrived at only after a complete research in the wind tunnel and water basin extending over a period of twelve months. We are only able to give some brief particulars of the S-40 at present. In general appearance the S-40 is not unlike the S-38, which has previously been described in FLIGHT. 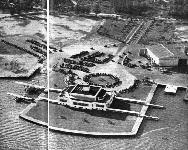 That is, it has a central boat-like hull, above which are mounted the monoplane wings, the four engines (575 h.p. Pratt and Whitney "Hornet B"), and the tail planes, carried by outriggers from the main wings. Very short lower wings also extend from the sides of the hull and on the tips of these are mounted lateral floats. The large size of the hull not only permits unusual room for passenger accommodation - the roomy cabin combined with large windows and unobstructed vision, height of cabin, and perfect ventilation giving, it is claimed, exceptional comfort - but, with its properly designed lines, exceptional seaworthiness qualities are promised. Pilot's cockpit can be used either open or closed. Power plant units complete with oil tanks will be easily and quickly interchangeable. Engines will be provided with starters and adjustable metal blade propellers. Storage space and hoisting arrangement will be provided for carrying a spare engine. Fuel tanks will be located in the wing with gravity feed and capacity for four hours' flight. Balance of the fuel will be carried in the tanks located on the top of the floats. Cross feed valves permit any engine to be supplied from any tank. A walk-way will be provided along the lower structure to the side pontoons. The location of the motors with relation to the cabin will eliminate disagreeable noise. A special compartment will be provided for luggage and mail up to 250 cubic ft. It is claimed that the machine will fly and climb with any one engine stopped, carrying full load. The boat hull has ample flotation with not less than five water-tight compartments, any two of which will keep the ship afloat. In case of damage to the side floats, the petrol tanks will be capable of keeping the ship in balance while afloat. No passengers or crew are located in the plane of rotation of the propellers, while the location of the engines, no engines or propellers being in front, provides good visibility for the pilot. Wings. - All metal dural construction covered with fabric. Spars are open section. Warren trusses riveted and bolted on gusset plates. Ribs are of dural. Leading edge will be partly covered with dural sheet to retain correct shape of the airfoil and also give extra rigidity. Ailerons are of balanced type and so constructed that all vibration at any speed is entirely eliminated. Hinges are readily accessible for check and greasing. Ample openings for inspection will be provided throughout on the wing. Interior bracing is high grade round and square steel tie-rods. Before covering, the structure will be painted with proper protective paint. Struts. - Dural streamline tubes and structural dural boxes will be used. Lower structure will be readily accessible for painting and greasing to prevent corrosion. Hull. - The structure consists of dural open sections riveted to the skin, which is of Alclad sheet. "Auld-metal" floor will give neat appearance and long life. Bottom structure is so designed that no water can stay in hidden places. Ample ventilation and accessibility will be provided to permit inspection and repair of all parts of the boat hull and especially the bottom structure. A strong keel will be provided to withstand the most severe condition if the bottom touches ground. Main entrance is so located, at the rear of the hull, as to permit passengers to board the ship with comfort and complete safety while the engines are running, either on land or water. There will be three emergency exits in addition to the main entrance. Tanks. - Petrol and oil tanks are of riveted dural sheets, and constructed according to the new and considerably improved Sikorsky method. Pressure tests will be made according to the requirements of the Department of Commerce. Surface controls. - These will be of the same type as on the S-38-B Amphibian, with the addition of a dual control combination. Ball bearings are provided on all controls to reduce the effort necessary. Equipment. 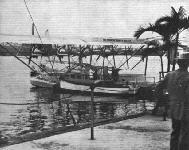 - The aeroplane will be equipped with propellers and starters, standard flight and navigation and motor instruments, marine equipment, comfortable chairs, sleeping quarters for the crew, kitchen and buffet arrangements, separate toilet facilities for ladies and gentlemen, fire apparatus, life preservers, and complete equipment as required by the Department of Commerce. Dimensions. - Span, 114 ft.; chord, 16 ft.; height (on wheels), 22 ft. 11 ins. ; length, 72 ft. 11 ins. ; wing area, 1,980 sq. ft.; power, 4 Pratt & Whitney "Hornet B," total 2,300 h.p. Performance. - Useful load, 11,250 lbs. ; high speed (sea level), 129 m.p.h. ; cruising speed (1,700 rev. ), 108 m.p.h. ; climb (first minute with full load), 675 ft. per minute; ceiling, 13,000 ft.; stalling speed, 65 m.p.h. ; cruising speed on 3 engines, 90 to 100 m.p.h. ; weight of amphibian gear, 1,250 lbs. 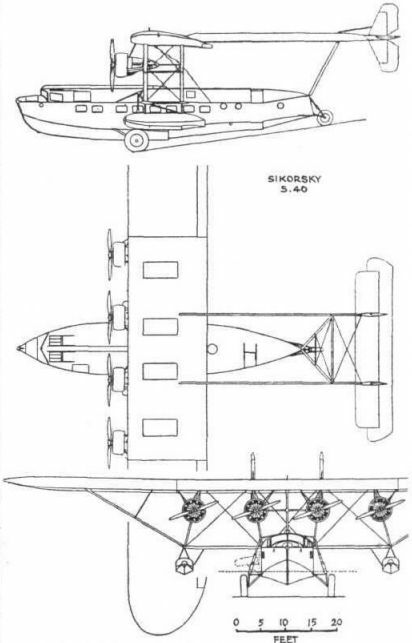 GENERAL arrangement drawings of the Sikorsky S.40 amphibian, which has recently made successful trial flights in America, are shown in the accompanying illustration. 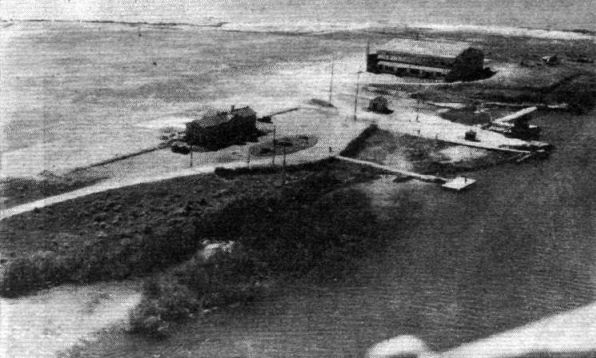 As previously recorded in FLIGHT, Pan American Airways, which operates the passenger and mail air services between the United States and Central and South America, has been making an exhaustive study of means of connecting with Imperial Airways' European services by way of Bermuda and the Azores. Although Pan American Airways have had considerable experience during the past four years with comparatively long over-water air routes, their equipment has been limited to machines of a gross weight of 7 or 8 tons with a cruising range of about 500 miles. This has not, however, enabled a comparison to be made with longer ranges, such as across the Atlantic or as on the England-India and England-Africa routes of Imperial Airways. Therefore, while present schedules do not yet afford sufficient passenger volume to justify the purchase of machines of a comparable size, it was considered that the coming requirements for long over-water nights with heavy loads justified ordering two experimental machines of a size far beyond any which had hitherto been designed and built in the United States. An order was therefore placed with the Sikorsky Aircraft Corporation for two four-engined amphibians of 17 tons gross weight, and the S.40 under review is the result. It is not intended to use these machines for Transatlantic service, but they will be put into commission on the 1,300-mile over-water route between North and South America, where their performance will be studied very closely with regard to development for the longer transoceanic flights. The Sikorsky S.40 is a high-wing monoplane not unlike the smaller well-known Sikorsky S.38 and S.41 amphibians, that is, of the "short" hull type with the tail surfaces carried on outriggers from the main plane. It is powered with four 575-h.p. Pratt & Whitney direct-drive "Hornet" engines mounted below and forward of the leading edge. The single vee-bottom hull, carrying 40 passengers and crew, is of all-metal construction, incorporating extruded duralumin shapes and Alclad sheets, assembled with dural rivets. A pair of outboard floats, strut-braced to hull and wings, aid stability on the water. Fully retracting landing wheels, and a tail wheel, are provided, but the machine can be flown as a flying boat with considerable improvement in performance. The wing frame is built up of extruded duralumin sections, and formed dural sheet with a certain amount of steel plates at various fittings. The entire frame is covered with fabric with the exception of a metal skinned portion of the centre section over the engine nacelles. During test flights with full load the machine attained a top speed of over 130 m.p.h., a cruising speed of 110-115 m.p.h., and landed at approximately 65 m.p.h. A rate of climb of 712 ft./min. was obtained, and an absolute ceiling of 13,500 ft. is anticipated. With full load and three engines running a ceiling of 6,500 ft. has been attained, and level flight at 2,000 ft. has been maintained on two engines with a gross load of 29,000 lb. With a gross load of 34,000 lb. the S.40 attained an altitude of 5,250 ft. in ten minutes. The principal characteristics of the Sikorsky S.40 are :- Span, 114 ft.; overall length, 76 ft. 9 in. ; wing area, 1,868 sq. ft.; gross weight, 34,000 lb. ; weight empty, 21,500 lb. ; useful load, 21,500 lb. ; wing loading, 18.2 lb./sq. ft.; power loading, 14.8 lb. /h.p. ; speed range, 65-130 m.p.h. ; range (40 passengers), 500 miles; (20 passengers), 950 miles. Компания Сикорского построила три гигантские летающие лодки S-40, которые поступили в эксплуатацию в компанию "Pan Am". Самолеты были поставлены с октября 1931 года по август 1932 года и получили собственные имена - "American Clipper" (на рисунке), "Caribbean Clipper" и "Southern Clipper". В годы Второй мировой войны их утилизировали. 16-тонный S-40 представлял фактически сильно увеличенный вариант S-38 и стал самым большим гражданским самолетом своего времени. На снимке - "Southern Clipper". 19 ноября 1931г. : первый Clipper компании "Pan American", Sikorsky S-40 Southern Clipper, nod управлением Чарльза Линдберга вылетел из Майами, Флорида, в зону Панамского канала. 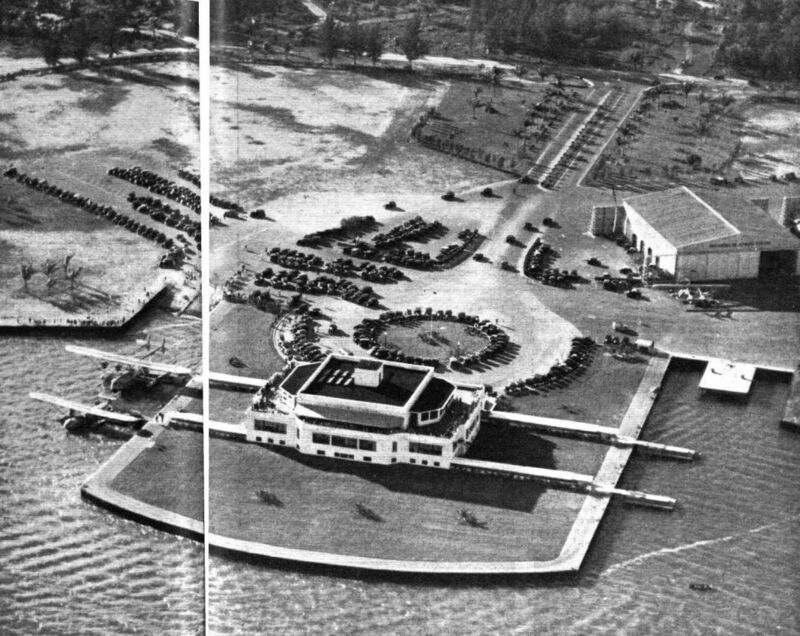 "Pan American" 20 декабря 1929 года заказала три таких летающих лодки, способных перевозить по 38 пассажиров. 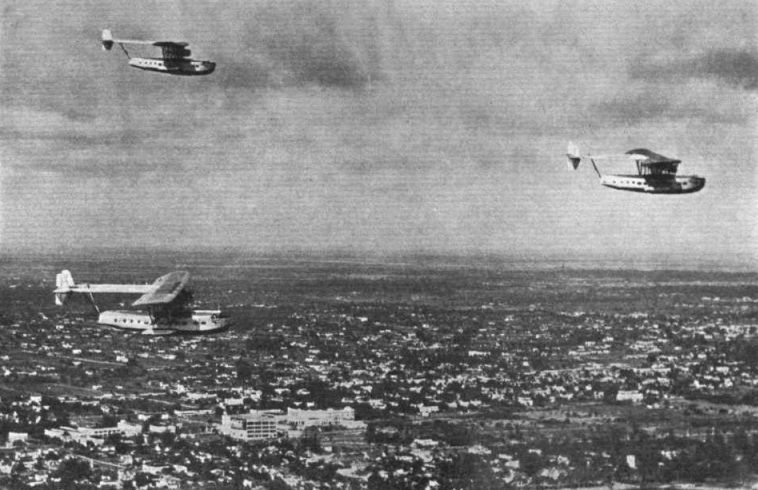 MODERN LINKS OF TRADE BETWEEN THE AMERICAS: Three of the large Sikorsky S-40 airlines of Pan American Airways flying over Miami. These machines, carrying 40 passengers each, are used for operating a daily service between Miami and various parts of South America. The Sikorsky S.40 Amphibian (four 575 h.p. Pratt and Whitney "Hornet" engines).